This is a very difficult puzzle. It looks a bit like the planet Saturn, a ball with a ring around it. The ring consists of 13 numbered pieces, which are white on one side and yellow on the other. This ring can be rotated around the ball. There are two round caps which lie on opposite sides of the ball and which are bisected by the ring of pieces. One cap is 4 pieces wide, the other only 3. These two caps can rotate, which reorders the pieces of the ring. The caps are not independent, they can only rotate simultaneously. The aim is of course to restore the pieces to numerical order with a single colour on each side. The US patent was filed on 4 February 1997 by Andreas Unsicker, and finally granted on 21 Dec 1999, US 6,003,868. This leaves 12!·212 = 1,961,990,553,600 or 1.9·1012 positions. IBRT has a little research on the order of various short move sequences. This is the notation used on the Brainball homepage, and it is similar to my notation for the Square-1. Consider the ball to be fixed in place, with the ring moving around it. Clockwise turns of the ring are denoted by a number, indicating how many pieces the ring moves. Similarly negative numbers are used for anti-clockwise turns. A slash character (/) is use to denote a twist of the blue caps. I'll say a piece is in pole position if it lies in the middle of the small blue cap. In the last phase we will also have to specify the various positions the pieces can be in. The piece positions are lettered A to M starting clockwise from the pole position. The Brainball homepage recommends ordering the pieces first, and then orienting them correctly. I prefer to do the opposite, first getting them all one colour and then positioning them properly. Phase 1: Make all pieces the same colour. If you can, do any move that makes more pieces of the desired colour. Repeat step a as often as possible, until only most pieces are of the right colour. For each remaining piece that needs to be flipped, put it in pole position and then use 2/-2/2/-2 which flips it. If the pieces are now in an odd permutation, then you will have to flip all the pieces. It is not easy to see whether it is an odd permutation, so you could just try to solve it as in the following phase, and if you are left with just two pieces that need to be swapped then you will have to come back to this phase. Alternatively you could cheat by marking the sides of the ball with the colour of the pieces before getting the puzzle mixed up. If in an odd permutation then do /6/4/1/1/-2 to flip all the pieces. This sequence preserves the order of the 3 pieces on the small cap. If the piece order does not matter at all, then you can do /5/5/ instead. Phase 3: Ordering the pieces. The sequence 1/-1/6/-6/-6/-6/-1 cycles only pieces in positions A, B and C around: The piece in pole position moves to position B, the piece in position B moves to position C, and the piece in position C moves into pole position. 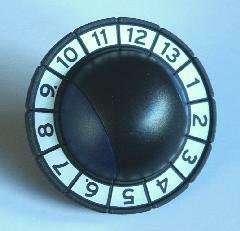 Rotate the ring to bring piece 1 in pole position, and then do -1. Find the piece 2, and note its current position. Look up the sequence in the table that moves a piece from that position to pole position, and do it. Repeat steps b-d for each of the pieces 3-12 to solve it. Make sure that the sequence you choose will not disturb the pieces that are already solved. Sometimes there are several alternative sequences in the table, so that you may be able to solve two pieces simultaneously. For example, if you have solved pieces 1, 2, and 3 then place them in positions K-M, so that piece 4 will have to be placed in pole position (A) to extend the solved block. Find pieces 4 and 5, and let's suppose they are at positions D and C respectively. Look through the table to find a sequence with D in the second column, and C in the third. Unfortunately the only such sequence has 2 in the first column, meaning it will disturb the three solved pieces you already have. You will therefore have to choose another sequence, and be content with only solving piece 4 with it. Of the sequences with at least 3 in the first column, and D in the second, this is the shortest, and therefore the best one to use. If you end up with a position where you would have to swap the final two pieces, then you have to flip all the pieces round as explained in phase 2. Appendix: Some other neat sequences. The following sequences cycle three pieces around, without altering the orientations. All possible three-cycles are represented here, though you may have to turn over the puzzle and/or perform the inverse of the given sequence.